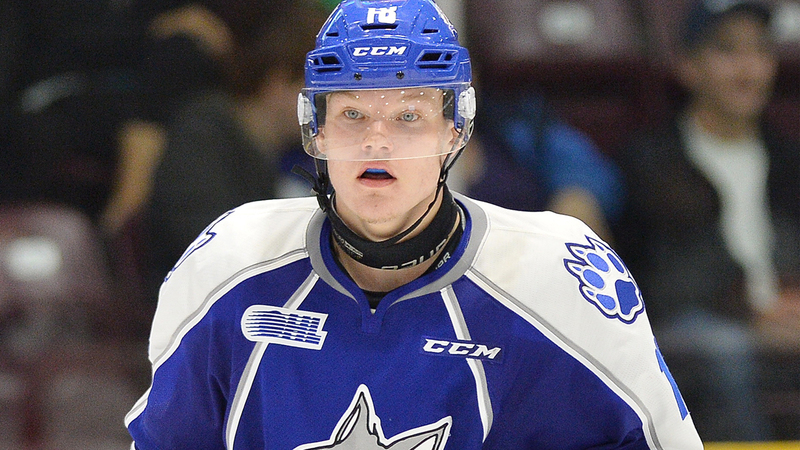 Maybe there’s something about the Sudbury Wolves that turns teams off when they’re scouting for the NHL draft. Two summers ago, Kyle Capobianco was drafted by Arizona in the 3rd round, despite being one of the highest scoring draft eligible defenders. Last year, it was Dmitri Sokolov that scored 30 goals while showing flashes of elite offensive talent, only to tumble all the way to Minnesota in the 7th round. Sokolov went on to score 48 goals in 64 games this season and is looking like he’s going to turn into an absolute steal for the Wild. This year, the underappreciated draft prospect in Sudbury is MaCauly Carson – a 6’1 forward that isn’t even ranked in the top-200 by NHL Central Scouting, despite being one of the best goal scoring draft eligible players in the OHL this season. Carson finished the year with 30 goals – behind only Owen Tippett, Nick Suzuki, Jason Robertson, Jonah Gadjovich and Matthew Strome, all of whom are expected to be drafted in the first two rounds this June. Carson is listed as a left winger, though he plays a lot of centre for the Wolves. At 6’1, 211lbs, he has a big, strong frame and looks a lot more physically mature than many players his age. He uses his strength to play a physical game, but he does it while remaining under control – he finished the season with only 37 penalty minutes. He is a smart player that has the ability to play every position up front and in any situation his coach asks of him. Carson finished the season with more goals shorthanded (4) than he did on the powerplay. He’s an incredibly hard worker and plays a style of game that is conducive to success at the pro level. His 23 5v5 goals are made even more impressive by the fact that he doesn’t play first line minutes like most at the top of the OHL scoring list. Those around the Wolves rave about Carson’s leadership qualities and his willingness to learn and improve. He’s a defensively responsible player, finishing 3rd among draft-eligible OHLers with a 12.83 GF% relative to his teammates. Carson is a coaches dream, and normally the kind of prospect that is overrated – not underappreciated. So why isn’t he getting any respect whatsoever by the scouts? Carson will never be described as ‘fleet of foot’. That said, he worked on his foot speed, and his skating improved drastically this season compared to where it was as a rookie in 2015-16. Also, while he scored a lot, Carson did so with an unsustainable shooting percentage in the 24% range. He’s not the best at creating his own offense, but he is great on capitalising on the chances he does get. A strong net presence, a lot of his goals are scored from within a few feet of the crease. He’s not an overly ‘skilled’ guy and will never project to be a top-6 forward in the NHL, but for the scouting services to be completely ignoring Carson is absurd. At the start of the season, NHL Central Scouting had Carson as a ‘C’ prospect. At the midterms, they ranked him 186th among North American skaters – and now, after completing a 30-goals season, NHL Sentral Scouting doesn’t even have him ranked among their top-200. I won’t claim to know everything about junior hockey or the players in this draft, but one thing is for certain – there are not 200 North American skaters that are better prospects than Macauley Carson. Carson is an example of a player having one or two mediocre (or worse) games with scouts in the building and being unable to dig out of that hole. The fact that he plays in Sudbury means that eyes aren’t going to be on him as much as they are for prospects playing closer to the GTA. Scouting services are dropping the ball when it comes to properly valuing Carson’s potential as a professional player. I’m willing to bet there are a few NHL scouts that are hoping their peers do as well. Carson will be drafted in the second half of this draft – likely much later than he should – and he’ll add legitimate depth to an organisation. He won’t be their top prospect, but don’t be don’t be surprised when Carson is suiting up in a third line role for a good NHL team in a few years. Next Could the Maple Leafs be Interested in Swiss Defenseman Romain Loeffel?